Nineteen Sixty-four: Catholics come home... But just for a visit? Catholics come home... But just for a visit? 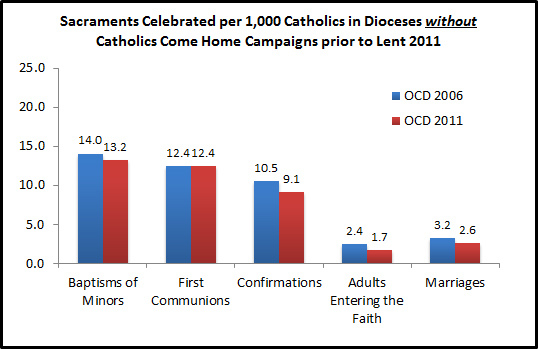 The CCH website includes a series of change measurements for their campaigns in dioceses. 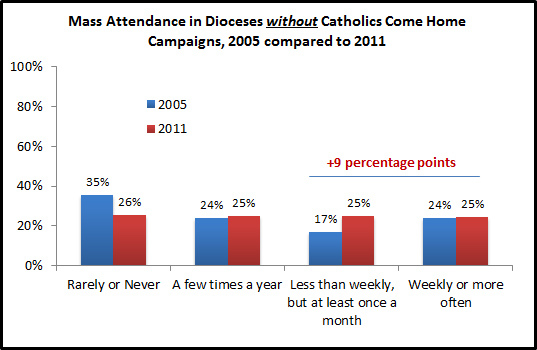 For example, in the Diocese of Phoenix (Lent 2008) Mass attendance is estimated to have increased 12%. Even more reportedly returned in the Diocese of Corpus Christi (Lent 2009 up 17.7%). Results in the Archdiocese of Seattle (Lent 2010 up 4.5%) and in the Diocese of Colorado Springs (Advent 2009 up 6.1%) were a bit more modest. Taken all together, with the previous diocesan campaigns and now the national effort, this means that in January 2012 we might expect about 1.3 million more Catholics will be active in the Church than were active in January 2008 (beyond what we would expect through population growth, other evangelization efforts, and just normal life-cycle returns). As much as I personally find “Epic: 120” to be appealing and uplifting (it reminds me a bit of Ronald Reagan’s 1984 classic political ad “Morning Again in America”), the social scientist in me is naturally skeptical of some of the cause and effect claims made regarding these ads. I specifically have concerns about how CCH and others have apparently measured some of the reported Mass attendance effects of these campaigns. If you are measuring changes in Mass attendance you must pay very close attention to the Church calendar and only compare attendance during similar periods (i.e., “apples to apples”). There are regularly understood seasonal changes in Mass attendance each Advent and Lent—with or without television commercials. And this is no recent phenomenon. It’s been occurring for decades—perhaps first documented in studies by Father Joseph H. Fichter, S.J. such as, Southern Parish: The Dynamics of a City Church (Volume I, University of Chicago Press, 1951). Currently, CARA surveys estimate that 23% of self-identified adult Catholics attend Mass every week. Yet, in any given average week, 31% of Catholics are attending. During Lent and Advent, Mass attendance increases into the mid-40% range and on Christmas and Easter, an estimated 68% of Catholics attend. Take for example the Diocese of Green Bay where this CCH Mass attendance comparison was made: “A Mass attendance census, taken on two weekends in over 150 area parishes last April, found a 7.4 percent increase compared to an October 2009 census.” October headcounts—done in nearly all dioceses—are completed at this time of year because it is in Ordinary Time and can be considered a period of relatively “typical” levels of attendance. There are two periods of the year with consistent and sustained increases in attendance—Advent and Lent—the periods when Catholics Come Home do their diocesan campaigns. There should be no surprise that Mass attendance during these periods is higher than in October in any diocese. Michael Cieslak, Ed.D., Director of Research and Planning in the Diocese of Rockford has presented evaluations of the CCH program for his diocese last year and again at this year’s Religious Research Association annual meetings. Cieslak has noted that the ads appeared to boost Mass attendance during and shortly after the campaign in Advent of 2009. But this bump in attendance has largely dissipated and two most recent headcounts indicate that Mass attendance has returned to pre-CCH levels. There are other sources of data that can be tapped to measure potential CCH campaign effects. CARA conducted a national survey of adult self-identified Catholics on media use a few months ago. Results from this survey can be compared to a similar study conducted in 2005 (prior to any CCH campaign). Both surveys have a similar structure and content and both included a diocesan identifier for each respondent (representing their diocesan newspaper). We can use these two surveys to separate respondents by time (pre- and post-CCH) and by dioceses that have and have not had a CCH campaign. As one can see in the figure below, in the 27 dioceses that have completed a CCH campaign or where the ads were pilot tested (as listed on the CCH website map), Mass attendance is up in 2011 compared to 2005. The percentage of self-identified adult Catholics saying they attend at least once a month has increased by 8 percentage points (38% in 2005 compared to 46% in 2011). This shift is beyond the margin of error (the 3 percentage point increase in weekly attendance is not statistically significant). In isolation, this appears to be a confirmation of the CCH claims for increased activity in dioceses that have conducted campaigns. The problem? The same change occurred in dioceses that did not have CCH ads air. 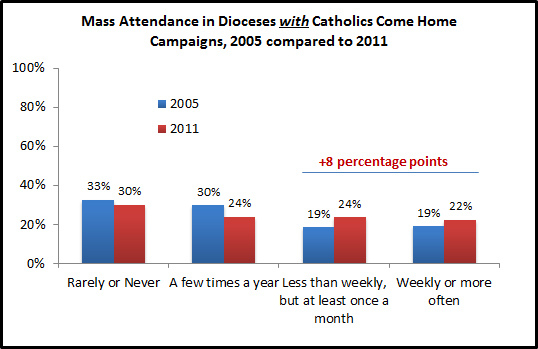 Here the monthly Mass attendance group increased by 9 percentage points (41% in 2005 compared to 50% in 2011). It is certainly possible that the CCH campaigns may have “spilled-over” into other dioceses and that these data still confirm a measurable effect, but I am not sure this is likely. Many people see the CCH commercials on television in the dioceses where the ads are air. There does not appear to be a widespread number of views of CCH ads outside of these dioceses (i.e., where Mass attendance also increased). For example, the CCH YouTube channel has only about 1,400 subscribers and about 32,000 channel views since it was established in March 2008. More than 385,000 individual views of its videos have been made. These are all quite small numbers on a national scale. Most of the views are of the “Epic: 120” video (about 227,000 over more than 3 years... there are smaller numbers of views of this video on vimeo, godtube, dailymotion, metcafe, etc.). Forty-one of the 45 videos on the CCH YouTube channel have less than 5,000 views each (33 of them have less than 1,000 views each). There are more data that can be compared, as reported by dioceses, in The Official Catholic Directory. The most recent 2011 edition presents the state of dioceses as of January 1, 2011—before Lent of this year. In the figures below I have compared dioceses where CCH ads aired (18 in total; again as listed on the CCH website) and those that did not up to Advent of last year. Sacramental activity rates (celebrations per 1,000 Catholics) have not increased in CCH dioceses from 2006 to 2011—including numbers of new Catholics entering the Church as infants, children, or adults. Much like the Mass attendance comparison, there are also no significant differences between dioceses with CCH campaigns and those without them. It is the case that dioceses that completed CCH campaigns report significantly more growth in their Catholic populations between 2006 and 2011 than those dioceses that did not have a campaign between 2006 and 2011 (nearly +1.2 million more Catholics in total). However, these CCH dioceses still had declines in numbers seeking baptisms (infant and adult) during this period. This indicates that the Catholic population growth identified here is largely not through infant baptisms or bringing non-Catholic adults into the faith. Also, on closer examination, nearly all of this growth is concentrated in three arch/dioceses: Atlanta, Phoenix, and Sacramento, which also experienced significant total population growth overall in the last decade (we’ve commented specifically on the Archdiocese of Atlanta in a previous post). It may be that these three arch/dioceses represent the best evidence for CCH bringing former Catholics back to the faith. It is equally likely that these new Catholics were largely gained through migration and immigration to Sunbelt areas of the U.S. In ten of 18 arch/dioceses with CCH campaigns, the rate of Catholic population growth from 2006 to 2011 is either slower than that for the overall population in the arch/diocese or actually negative. I do not doubt that these are very well done ads. I do not doubt that they do a lot of good by creating a positive Catholic presence in the media. I'm sure there are thousands of anecdotes indicating positive effects that can or already have been profiled. CCH has a number of very positive and touching testimonials. I think the CCH effort deserves support, encouragement, and hope. Regardless of any data or statistics, Tom Peterson, CCH Founder and President, deserves a lot of credit and admiration for leaving a secular for-profit advertising business to set up a non-profit media ministry and then doing so much with this to create positive changes in the U.S. Church. I just don’t think hundreds of thousands or more people “come back” or “come to” the Church and stay based on a 120-second advertisement. If this does occur in Advent 2011 it will represent one of the most extraordinarily successful media campaigns of all time and counter decades of social science and market research that has largely concluded that media spots and persuasion campaigns more often than not have just “minimal effects” on decisions and behavior (here is an example from political science). In the data I can examine, evidence of lasting effects are hard to find for some of the claims being made. More often than not, I think the Mass attendance measurements and comparisons made for CCH campaigns are primarily capturing the “return” of Christmas and Easter Catholics (i.e., actually those Catholics who typically attend on Christmas, Ash Wednesday, Palm Sunday, and Easter) who aren't around in October or other times of the year. One might ask, “What could be more effective than a commercial?” Father Barron’s Catholicism is a possibility that comes immediately to mind. It is on television, like CCH ads, and CARA studies indicate that TV is the among most used mediums for religious or spiritual content. This series also has the advantage of being the content rather than an advertisement and can reach a much greater depth than what could be achieved in a two-minute ad. But then again CCH’s ads will be in prime time on major networks where Catholicism is harder to find (PBS, EWTN etc.) on these widely-watched channels. There is another possibility... I know new evangelization gets most of the attention these days but my hunch is that “old” evangelization would still work well. For Father Fichter it was a research method (i.e., the parish census) but I think it could be much more. What if parishes actually sent out volunteers to knock on doors? Introduce themselves. Let people know of the parish down the street (perhaps leaving a card with parish information and contacts). Offer help to those in need. Listen to the complaints of the disaffected. Ask, in person, for Catholics to come home by going to their homes. With enough volunteers it could be less costly than the old media and new media approaches and likely even more effective.